This hub is a direct replacement for the early to mid 70"s Impala with disc brakes. It is machined from solid billet steel and features a bolt on rotor mount that fits the standard 8 bolt 7" bolt circle rotor. It uses stock bearings and races. This is a lightweight alternative when the rule require steel hubs. 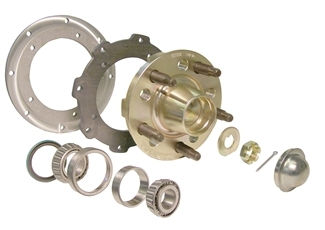 “Bearings, races, dust cap, axle nuts, washers, rotors and or rotor plates all sold separately. "WARNING: This product contains a chemical known to the State of California to cause cancer and birth defects or other reproductive harm."